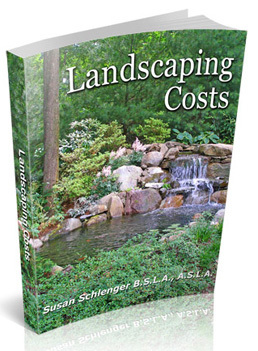 This is the book you need to determine landscaping costs! Landscaping Costs Ebook My Landscaping Costs book is one of my latest ebooks, and it will eliminate any fear you have of planning landscaping while not knowing the pricing. After all, how can you move forward if you don't have a clue as to whether you can afford it or not? Now you will know! There are 28 detailed pages on pricing for almost all landscaping items. I even include pictures as examples so that you can see, for example, what various haardscape materials and combinations look like. You will find out the costs of all the following items! Plants - trees, shrubs, perennials and groundcover, in various sizes. How do I know the costs? First, I worked in design/build for years where I had to do project estimating. Second, I now often review bids for my clients from landscapers. With over 14 years experience, I have been involved in the pricing of MANY projects! I designed and wrote this book because I understand that many homeowners have no idea how much landscaping costs. Everyone has a certain amount of money they are prepared to spend, no matter what their situation…even the most wealthy! With this book, your questions will be answered so that you can plan your landscaping in a realistic way. For example, you will discover that a 350 sf patio will cost approximately $5250 in pavers, but only $2800 in concrete. That is just one small example! I offer an unconditional money back guarantee, no questions asked. That's how sure I am that you will find this book helpful. There is no other book out there that I know of that offers this information.